Wednesdays May 15, May 22, May 29, June 5, June 12, June 19. Group1: 5:45–6:45; Group 2: 6:55–7:55. Program Description: Ausome is excited to team up with Glow Sports Ottawa to offer a 6-week GLOW Soccer session. 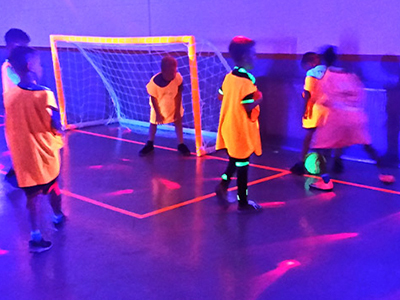 Ausome athletes will have the opportunity to improve soccer skills while glowing in the dark! Glow Sports will provide the glow jerseys (will need to be returned), equipment and maybe glow face paint [non-toxic – we double checked 🙂 ]. Our Ausome Coach, Quinn, will be running the drills and games to get our athletes moving and learning! NOTES: This sensory experience may not be for everyone. If an Ausome athlete is not enjoying the change in lighting, please don’t feel pressure to continue participation in the program.